A 20-year-old man has been told to bring £200 to Craigavon Magistrates Court to pay for damage he caused in a hospital or he will be going to prison. Nathan Power, whose address was given to the court as Springwell Gardens, Lurgan, admitted criminal damage to a wall at Craigavon Area Hospital on March 22 this year. The court heard that in the early hours of the morning police saw the defendant who told them he had taken alcohol and ecstasy tablets and wanted to go to hospital. Police took him to hospital and when his parents arrived they left the scene but returned a short time later. Power had wanted to leave the hospital before he was seen by a doctor but his parents wanted him to stay. 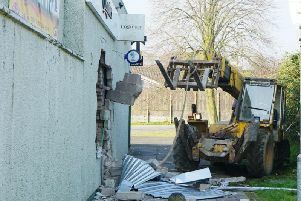 He then struck a wall with his fist causing £200 worth of damage. Five days later he attended at Lurgan police station and made a full confession. He was very apologetic. Mr Peter Murphy, representing the defendant, said they had only been informed on the morning of the court the cost of the damage. District Judge, Mrs Bernie Kelly, said that the true sign of remorse would be if he had £200 with him. She adjourned the case and told the defendant if he didn’t have it on the next occasion he would be going to prison.